Chaim Freedman's family originated in the Raseiniai district of Lithuania. David Hoffman coordinated the Raseiniai researchers for the LitvakSIG and they developed a collegial relationship over several years. Hoffman accumulated documentation about his family’s oral tradition of a relationship to the Vilna Gaon. He discussed this with Chaim Freedman, who was studying the family of the Gaon. Freedman became very supportive of Hoffman’s efforts to obtain early 19th century Russian Empire revision lists and 1784 and 1765 censuses from the Grand Duchy of Lithuania. Together they traced some lines of their families back to the 18th century. 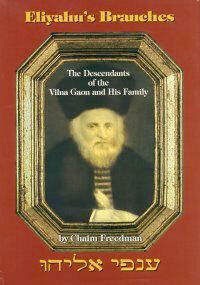 Research of the family of the Vilna Gaon was published in 1997 by Avotaynu as Chaim Freedman’s book Eliyahu’s Branches, The Descendants of the Vilna Gaon and His Family. There Freedman explained that the number and order of birth of the Gaon's children and their ages was not consistent in the sources. Aside from some biographies, it is necessary to study texts that, although their specific purpose was not to record the biography of the Gaon or his family, include passages from which familial information can be interpreted. These texts include in particular the introductions to books written by the Gaon. The number of children recorded in these sources ranges from a minimum of two sons and one daughter to three sons and five daughters. It seems quite certain that only three sons survived to adulthood. Five daughters can also be established, but there may have been others. The dates of birth of the Gaon's children are significant in order to establish or counter claims of families that they are descended from one or other of his children. The time period between the earliest known ancestor of claimant families and the birthdates of the Gaon's sons may preclude such a claim. On the other hand, since most of the Gaon's daughters were older than the sons, there is the possibility of a greater number of intervening generations between the daughters and hypothetical descendant families. Therefore, there may be a greater number of possibilities of descendant lines from the Gaon's daughters than from the sons. Given that the estimated age difference between the Gaon's eldest and youngest child is about twenty-five years, researching the line of descent must take into account the possibility of a variation of an entire generation in the ancestral line, depending whether descent is sought from the older or younger of the Gaon's children. The Vilna Gaon was identified in Vilna (Vilnius) in the first Russian Empire revision list (census) in 1795 and in the two censuses from the Grand Duchy of Lithuania of 1784 and 1765. Some of the daughters’ names were discovered for the first time by using these lists. But Freedman particularly wanted to find a son of the Gaon, Abraham, who was not listed in the Gaon’s household in 1765. Since he was aware of Abraham’s wife’s family, he was able to use this information to seek Abraham. At 59 Ulica Zydowska: Elias son of Hirsch and his wife Chaia, with four children: Joseph (not married); Berko (married to Dwera with three children Leib, Chana and Sora-Rocha); Bejla (married to Aizik son of Abraham); and Minda (married to Nowach with one child Mirka). Also, Elias' father Hirsch, a widower; and five servants. This information is consistent with what is known of Elias (Eliyahu Pesseles) and his family. For his son-in-law Nowach it is clear that he must be recently married to Minda and that as of February 27, 1765 - the date of the census - they only had one daughter, Mirka. His daughter Sarah, who was later to marry Abraham son of the Gaon was not yet born, and this is consistent with Freedman’s postulated birth date of circa 1765 for her future husband. Further information was consistent with what Freedman knew about the Pesseles family, and he was able to identify many members of the Gaon’s family. The widower Hirsch was a brother of the Vilna Gaon’s grandfather. Freedman then turned to the 1784 census to find Nowach and Minda, hoping that Abraham, son of the Vilna Gaon, would be living with his father-in-law. In the 1784 census, Freedman located Abraham in the household of his father-in-law Nowach Abramowicz (Noah Lipshitz, Mindes), along with Nowach’s wife Minda, and Abraham’s wife Sora. In this entry no children appear with Abraham, further indicating the proximity of the marriage to the date of the census. Finally, the 1795 Russian revision list records Abraham, son of the Gaon, with his age as 30. That means he was born in 1765, exactly the year stated in Freedman’s book and calculated by him from complex and often obscure references. This date is about 15 years later than the date "used" by other sources. Now the three lists 1765, 1784 and 1795 support Freedman’s scenario for the configuration of the Gaon's sons. Jewish Family History Foundation http://www.jewishfamilyhistory.org/index.htm for 18th century Grand Duchy of Lithuania records, 1795 and 1816 Revision Lists. Provided by Dr. David Hoffman and Professor Eric Goldstein. For additional information about the 18th century Grand Duchy Project and examples of other successful research, including Chaim Freedman's Komisaruk family of Raseiniai, Lithuania, follow the links at http://www.jewishfamilyhistory.org/. Learn more about the thirty years of scholarly research that led to the publication in 1997 of Eliyahu's Branches: The Descendants of the Vilna Gaon (of blessed and saintly memory) and His Family, by Chaim Freedman at the Avotaynu Website http://www.avotaynu.com/books/gaon.htm. The book analyzed many source materials, from religious writings to the writings of the Gaon and his disciples. Freedman's book about the Vilna Gaon contains a rare portrait of the illustrious 18th-century Eastern European sage, a discussion of his substantial influence on the Jewish world and a thoroughly-documented family tree listing more than 20,000 descendants of the rabbi and his siblings. A small portion of the tree--the first four generations--is available on the Web. This current article, using the previously unavailable 1795 Russian revision list and 18th century GDL census lists, resolves inconsistencies and provides new documentary evidence for Freedman's theories.